New Zealanders need to realise that many of the anarchists and Maori activists arrested on Monday are part of an international activist network. A key part of this network are the Mexican Zapatistas. 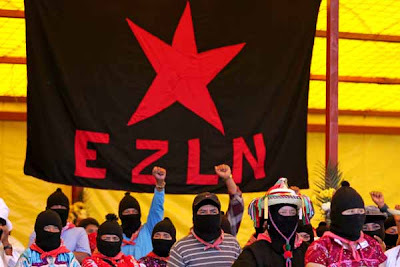 The Zapatista Army of National Liberation (Ejército Zapatista de Liberación Nacional, EZLN) is an armed revolutionary group based in Chiapas, one of the poorest states of Mexico. Their social base is mostly indigenous but they have some supporters in urban areas as well as an international web of support. Their spokesperson and military commander, although not their leader, is Subcomandante Marcos (currently a.k.a. Delegate Zero in relation to the "Other Campaign"). Unlike other Zapatista comandantes, Subcomandante Marcos is not an indigenous Mayan. In 1994, they "declared war to the Mexican state". Some consider the Zapatista movement the first "post-modern" revolution: an armed revolutionary group that has abstained from using their weapons since their 1994 uprising was countered by the overpowering military might of the Mexican Army. The Zapatistas quickly adopted a new strategy by trying to garner the support of Mexican and international civil society. They try to achieve this by making use of the internet to disseminate their communiqués and to enlist the support of NGOs and solidarity groups. Outwardly, they portray themselves as part of the wider anti-globalization, anti-neoliberalism social movement while for their indigenous base the Zapatista struggle is all about control over their own resources, particularly the land they live on. Many Maori radicals model themselves on the Zapatistas. The anarchist movement is also very supportive of the Mexican rebels. It is therefore no surprise to see that the 17 arrested on Monday are mostly anarchists or Maori activists. Wellington Zapatista supporters. Who do they remind you of? Now Julie Webb-Pullman, a NZ based journalist has confirmed the Zapatista/arrestee connection. WELLINGTON: Two hundred people today demonstrated outside the Wellington District Court in New Zealand, to protest Monday’s detention of four Wellingtonians, the first under the country’s new Terrorism Suppression Act. 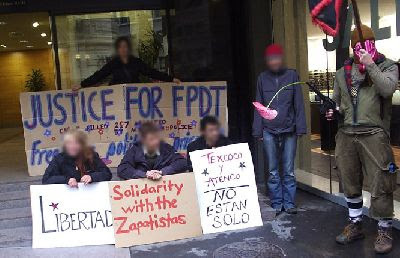 Two peace activists 'compas' from the Wellington Zapatista Support Committee are amongst these supposed “terrorists” – both of whom have been active in Oaxaca and Chiapas in the last year supporting the struggles in Mexico, and fundraising in New Zealand for health services for Zapatista communities. Webb-Pullman herself has been involved in the hospital fundraising. She has been involved in radical circles since her anti-Sprinbok Tour activism of 1981 and has close ties to the Marxist-Leninists of the Australian Democratic Socialist Perspective. She has contributed several articles on Latin America to the DSP's Green Left Weekly. Webb-Pullman has strong Cuban connections and has even worked for Cuban news agency La Prensa Latina. She has also worked extensively in Guatemala and Mexico and has Zapatista connections. In what way were these two activists "supporting the struggles in Mexico"? How deep are the links between those arrested and the Zapatistas? How integrated are their tactics? If New Zealand activists would support violent Mexican indigenous revolutionaries, why would they not do the same here? How freakin shocking. These people want to provide aid to health intiatives in Chiapas, the poorest state of Mexico. I thought you would support this Trev. This is private charity at work to help the needy. Pull the other one Cameron. How's Omar? Shame on you. A real libertarian would never applaud the police for imprisoning people due to their political activities, leftist or otherwise. You like so many so-called libertarians are nothing but a rightwing nationalist who has found a more palatable label for himself. The Zapatistas want to be able to live their own lives without government interference. If you were a true libertarian and in favor of government being "slashed to the bone," you would not be drooling over the prospect of their supporters being imprisoned for thought crimes! Lighten up "libertarian"-when did I ever do any such thing? do you support the military blockade of the chiapas region by the strong state of mexico and its government? You have posted nonstop about these arrests, clearly pleased and doing nothing but attacking those arrested. Where is your concern for the criminalization of thought going on here? The Zapatistas own guns for their own defense from the state, something most libertarians, at least in my country, believe in the right to do. They have not fired a shot in more than ten years. You need to get your priorities straight.